You spend a large portion of your adult life at work, so you want to be as happy and comfortable as you can. Life is full of stresses and worries, but if you can find ways of reducing them, then you’re on your way to unlocking the secrets of increasing your happiness, and not just at work. Implementing coping strategies and staying prepared for adversity are good ways to ensure that you stay calm in a crisis and can pick yourself up and dust yourself off after setbacks. 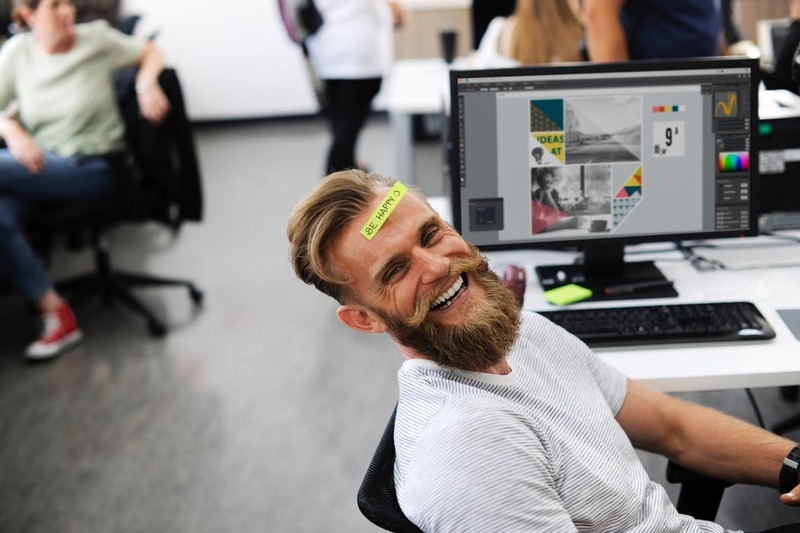 Staying happy and comfortable at work is going to help you to do your job and feel more capable of doing your work to a good standard. There are many ways to increase your happiness and comfortability at work; you just need to know what’s best for you. In order to stay happy at work, you will need to have the best technology and processes available to you. If you’re using outdated software, then your work is going to be harder, and it’s going to take longer. You cannot afford to waste your time if there’s lots of work to be completed. Slow and inefficient services could mean you are working into your lunchtime or working late after usual hours, and this is going to lead to unhappiness. If you work for a business company, then you will need your online presence to be doing the hard work for you. If you work in marketing or advertising, then optimizing this element is especially important. Once your company is well branded on the internet, then half of your work is done for you. This work can be done by a Marketing Consultant if you want an expert to make sure your digital presence is being optimized. This way you can happily get on with the other tasks you need to do. There is no one easy way to reduce your stress at work. However, you can learn to reduce the stress you feel. Stress at work will be due to a combination of variables so remember that there is no easy cure. Communicating how you feel can help others understand that you’re feeling out of your depth. If you have too much work piled on your plate, then tell your manager and see whether some of the tasks you have to complete can be delegated to other members of staff. This will help relieve you of some of the stressful deadlines that you might have approaching. Always communicate if you feel you’re taking on too many tasks at work as there could be an easy solution. Communicating with other members of staff can help increase bonds and add to the friendly atmosphere of your workspace. Try to get to know other team members, and socialize with them outside of work if you’re keen to establish a good relationship with them. Having friends at work will significantly impact how much you enjoy the job, so get chatting. Let’s face it; procrastination is something everyone does to an extent. You can learn to cut down on time you spend procrastinating by keeping to a schedule and being strict about keeping to it. Tell yourself that you will have finished one task by a certain time and don’t stop until you have finished it. You could tell yourself that you’ll have a particular project finished by lunchtime, as it’ll work as an incentive to get your work done in an allotted time. Try and figure out when you’re most likely to procrastinate, and see how you might go about fixing the problem. If you know you procrastinate when you’ve got a difficult piece of work to finish alongside other pieces, then make sure you complete the more challenging task first and then the others to follow will inevitably seem less arduous. The surroundings in which you work are important to how happy and comfortable you feel. If you work from a cramped and chaotic office, then you won’t be able to apply yourself, and you’ll feel stressed about working in such a mess. If you’re working environment is lit with oppressive lights, then you’ll feel stifled and uncomfortable, so if this is the case you need to raise your concerns to your manager. It’s possible that others agree with you so you could just get the manager to change the conditions you work in and redesign the office. A clean, sleek and open layout will benefit the working mind the best as you’ll feel at ease enough to focus entirely on the task at hand instead of your less than satisfactory surroundings. In the meantime, think about clearing your desk from miscellaneous items and adding some potted plants to your desk. Plants help to clean the air quality and have properties conducive to working. Getting a comfortable chair is going to benefit how you spend your day at work. If your job is largely office based, then it’s crucial that you are keeping comfortable and making sure your spine is kept straight. If you spend your working days spent sitting in a chair at the computer, then it’s probable that by the end of the day you’re experiencing some back discomfort and ache. You needn’t have to suffer from this discomfort as you can optimize your comfortability for opting to get a chair that has been recommended by a chiropractor. You’ll be able to sit for longer periods of time if you’re happy and comfortable in where you’re sitting. Look into getting one of these chairs and improving your spine health by visiting a chiropractor at regular intervals throughout the year or as many times as they recommend. Try to avoid feeling low after lunch by keeping track of what you eat. Avoid foods high in sugar and carbohydrates as you’ll inevitably experience a crash after your blood sugar has dipped after the sugar peak. Instead, have a lunch which is high in protein and make sure you’re drinking enough water to stay hydrated and keep your brain engaged.